Kia cars on show at a dealership in Moscow. MOSCOW (Reuters) -- Kia plans to maintain sales in Russia this year by increasing its share of the ailing market, the company's Russian Managing Director, Alexander Moinov, said. As Russia's car market has crumbled, hit by a steep economic downturn fueled by lower oil prices and Western sanctions, Kia has used lower prices to fend off competition and increase its market share to 10.2 percent. The Korean carmaker now plans to sell 160,000 vehicles in Russia this year, slightly down from 163,500 in 2015 but representing a market share of around 11 percent as rivals' sales plunge, Moinov told Reuters in an interview. "As a minimum, we want to maintain our share. At best, increase it," Moinov said. "Our goal is the horizon. We will see where the market takes us." Kia was Russia's No. 2 brand by sales through February after Lada. Kia's two-month sales fell 14 percent to 20,541 in a market down 21 percent, according to data from the Association of European Businesses in Russia. Capitalizing on the success of its budget Kia Rio sedan, which was one of only four models to post positive sales growth in Russia last year, Kia has managed to weather the decline of Russia's auto industry better than many of its competitors. "Kia is doing well in Russia as a result of having the right volume product in the form of the Rio," said IHS analyst Tim Urquhart. "It is rugged and reliable ... at a very competitive price point." The Rio was Russia's third most popular car last year. 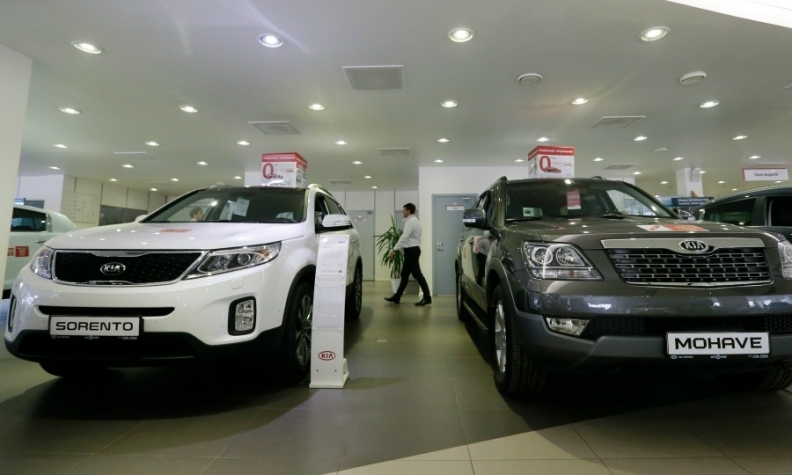 Moinov said Kia's investments in local production have allowed it to undercut rivals whose reliance on costly imported parts has forced them to hike prices to offset the devaluation of the ruble. The Russian currency fell more than 20 percent against the dollar last year, making production prohibitively expensive for some international carmakers such as General Motors, which quit the market and idled its plant in St. Petersburg. Kia's own St. Petersburg plant, which it operates together with sibling company Hyundai Motor, produces all of its Rio vehicles, meaning the model as a localization rate of 48 percent, Moinov said. Other foreign producers struggle to achieve a localization rate - a measure of imported parts used in construction - of around 40 percent. The price of a Rio increased 11.2 percent last year while average car prices in Russia have jumped 24 percent since November 2014, Moinov said. "We see a strategic goal in front of us and consider it an investment in the future, which Kia believes in," he said.